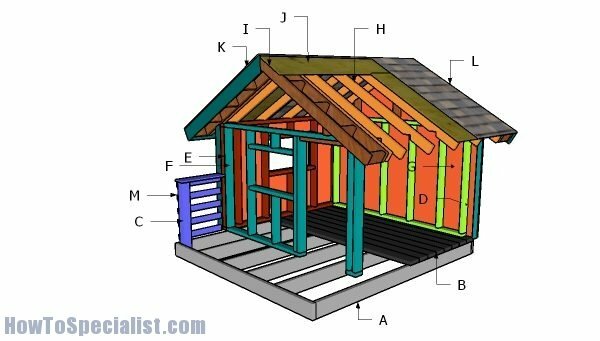 This step by step woodworking project is about free kids playhouse plans. I have designed this simple playhouse so you can keep your kids entertained and really happy. This playhouse is budget friendly and you can get the job done in just a few days, with basic tools and materials. Remember that you need to read the local building codes before selecting the right location for the shed and before building the shed. See my other DIY projects HERE. The first step of the project is to build the floor frame for the playhouse. Cut the joists from 2×6 lumber, as shown in the diagram. Drill pilot holes through the rim joists and insert 3 1/2″ screws into the perpendicular components. Align the edges and make sure the corners are square. Use 4×4 lumber for the rail posts. Cut the posts at 32″ and then fit them to the front of the frame. Drill pilot holes through the frame and insert 3 1/2″ screws into the base of the posts. Use a spirit level to plumb the posts. Make notches to the 2×6 board that goes around the rail posts. Use a saw to make the notches and then clean the edges with sandpaper. Fit the 2×6 boards to the floor frame. Fit a nail between the boards to create even gaps. Drill pilot holes and insert 2 1/2″ screws to lock the boars to the joists. Assembling the side walls is a straight forward job. Therefore, you need to cut the components at the right dimensions and then drill pilot holes through the plates. Insert 2 1/2″ screws into the studs. Align the edges and make sure the corners are square. As you can easily notice in the diagram, you need to frame a small window, so you can allow light inside the playhouse. Framing the front wall is a straight forward job, but remember that you need to frame a window and a door opening. You can adjust the size of the window opening and that of the door opening to suit your needs. Frame the back wall from 2×4 lumber. Place the studs every 16″ on center. Fit the wall frames to the floor of the playhouse. Align the edges flush and plumb them vertically with a spirit level. Drill pilot holes through the bottom plates and insert 3 1/2″ screws into the floor of the playhouse. Join the adjacent wall together tightly with screws. Attach the 1/2″ plywood sheets to the exterior of the back wall. Align the edges flush and insert 6-8d nails along the framing. Fit the panel to the front of the playhouse. Make the openings with a saw, so you can fit the panel around the window and around the door. 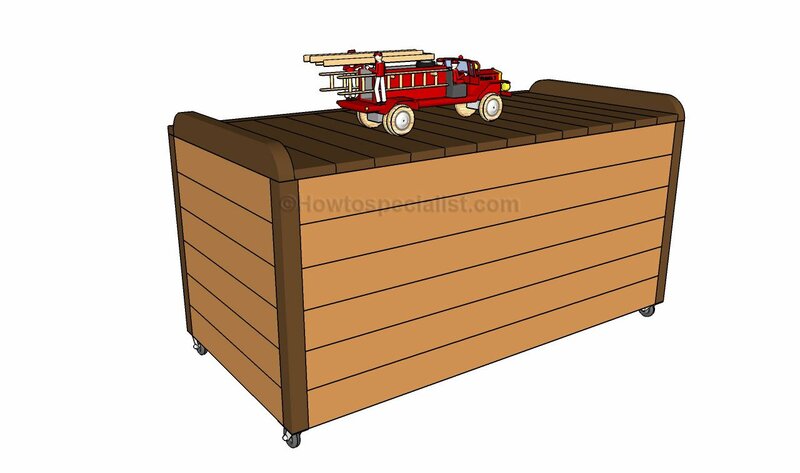 Fit the 1/2″ plywood panels to the side walls of the playhouse, as well. Make the notches so you can fit the panels around the window openings. You really need to take care of the finishing touches, such as applying the paint of the exterior of the playhouse. Once you attach the roof and the trims, it will be more difficult to access some areas. If you want to build the gable roof for this playhouse, you should check out PART 2 of the project. If you like my project, don’t forget to SHARE it on Facebook and Pinterest. Thank you for reading our project about free kids playhouse plans and I recommend you to check out the rest of the projects. Don’t forget to LIKE and SHARE our projects with your friends, by using the social media widgets. SUBSCRIBE to be the first that gets our latest projects.